This account first appeared in The Consultant, publication of the Hospital & Consultant Specialist Association, in October 1983. In 1942 the Reichs Luft Ministerium (RLM) asked Professor Tank of the Focke-Wulf factory to investigate the possibility of a single engined jet fighter. He was given the development plans of the BMW 003, Jumo 004 and HeS 011 engines. Late in 1942 the Project Office, led by Ludwig Mittelhuber, began to work on a series of fighter projects to be powered by one of these new turbo-jet units. Several of the early designs were to employ a number of Fw 190 components. Authorities vary as to the number of projects undertaken from 1942 onwards and some do not accept that the first one mentioned below should be included. Fw Project I: In this development a Jumo 004 engine was positioned on the fuselage back. The pilot was situated in the fuselage nose, and underneath were four units of armament. A low level wing was swept forward and V shaped set of rear control surfaces had sweep back. The main wheels of a tricycle undercarriage were so positioned under the fuselage that they could lie between themselves, when retracted. 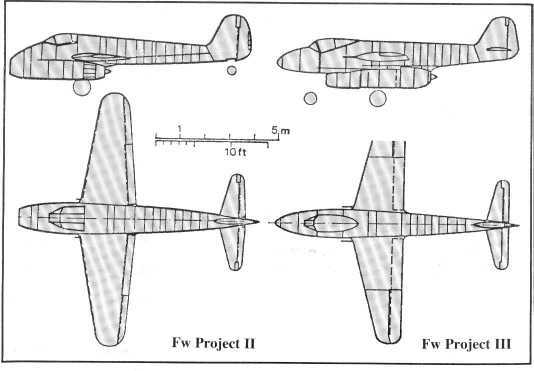 Fw Project II: The above construction., was so revolutionary that many manufacturing difficulties were envisaged; therefore a more conventional second project was undertaken. This was nothing more than a development of the FW 190, but powered with a jet engine, positioned on a redesigned fuselage. This engine, a Jumo 004, was to be housed beneath the nose. A conventional undercarriage was used. The low position of the jet intake raised the likelihood of foreign bodies being sucked up and in any case, the engine would burn the runway. This design development ceased in March 1943. Fw Project III (June 1943) In this project the under slung engine, the only available example of the Jumo 004, was to be positioned slightly rearwards in order to find space for the nose wheel of a tricycle undercarriage. The wing plan, now with a slightly swept back leading edge and straight trailing edge, was only slightly different from that of the Fw 190. It was felt that, even with this engine lay-out, foreign bodies could still be sucked in. Fw Project IV: (November 1943) In this development the Jumo 004 engine was positioned on the fuselage back. In order to solve the problem of a long outlet tube from the engine, the fuselage at the rear end was waisted and faired as a support for the rear control surfaces, which included twin rudders; however it was found that this arrangement increased the drag. Two jet intakes were positioned in the side walls of the nose of the fuselage, but this reduced the performance. The wings had the same plan form as Project III, but were a little thicker. Although the problems of foreign bodies had been solved, the general performance was not reckoned satisfactory. Fw Project V: (December 1943) It was with this project that the "Flitzer" series started. "Flitzer" has been incorrectly translated as "Madcap" by some authorities; "Streaker" or "Dasher" are much more accurate. In this scheme a central fuselage and two booms carrying the rear control surfaces were first instituted. This was at about the same time that the De Havilland "Vampire" was under development. When the "Vampire" was first seen in the Focke-Wulf Projects Office in 1945, there was considerable amazement at the marked similarity of the two aircraft. However, this similarity was due to nothing more than two independent development teams coming up with the same solution to a common problem. The Project V had the jet intakes still positioned on either side of the nose, just below the cockpit. Fw Project VII: (February 1944)the jet intakes were situated in the wing roots, like the "Vampire". 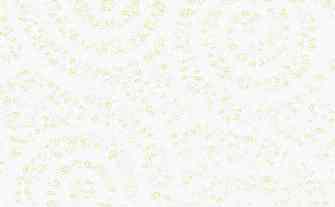 (It is possible that two forms of intake were considered, one triangular and the other rectangular.) 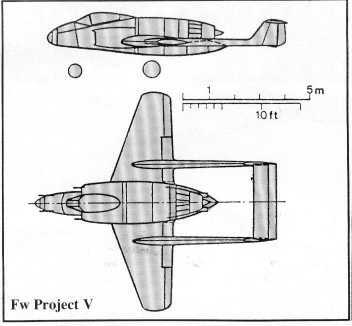 Further improvements over the Fw Project V were a narrower fuselage and a changed pilot's canopy. In order to improve the climb and interception performance a Walter HWK 109-509 liquid rocket was built-in. In spite of the fact that a complete mock-up was built and all construction and assembly plans finished, the aircraft was not accepted by the RLM. About the end of the Second World War Wng Cdr 'Mac' Morison, an officer in the Technical Intelligence branch of the RAF, who was investigating the German aircraft industry, confiscated a model of a jet fighter from the desk of the Managing Director of the Focke-Wulf Company. I inherited this model and it turned out to be a model of Project VII in this development series by that company. The model itself has a wing span of 160mms and a length of 195mms, giving it a scale of about 1/50th; it came complete with stand and seems to be made of wood, in which the grain has been so well filled that the surfaces are like metal. It is hand and spray painted immaculately, as can be seen in the accompanying photograph, and is a superb example of model making skills. The model is now in the Science Museum, London. Fw Project VI: Work then concentrated on the much more advanced "Huckebein" project. ("Huckebein" is a mythical raven which traditionally made trouble for others.) The scheme had been originally (January 1944) designated Fw Project VI, and subsequently Ta 183 (see below). This plane, intended for the new HeS 011 motor, originally a development of HirthMotorenbaues, followed the appreciation by Hans Multhopp, the development team leader, that all the previous projects had no chance of reaching fruition because none of had the potential of sound-barrier type speeds. His first development of Project VI utilised his thoughts on swept-back wings and produced an aircraft with a 40° sweep-back in the wings and an even steeper angle on the fin; a "V" tailplane sat on top of the fin. Many problems beset the project, including the chance of a Dutch roll. Work therefore concentrated on the much less problematical Project VII. However, when the RLM eventually rejected that design, "Huckebein" was again brought to the fore. Two developments of the original swept-back scheme were produced. The first of these had only minor modifications, with slightly differently shaped wingtips and repositioning of the undercarriage. 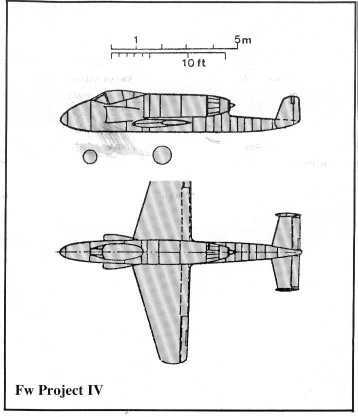 The second version had a reduced sweepback to 32° and the "T" tail format changed to one of a lower placed tailplane. The second of these two schemes was entered in the official competition ordered by the Oberkommando der Luftwaffe at the end of 1944. That competition was won by the Junkers Ju EF 128, a plane of somewhat similar shape to the later DH Swallow; the Focke-Wulf team gained second place. However, in the last few weeks of the war, it was decided that the "Huckebein (Ta 183)" was really the best design and, at a meeting in Bad Eilsen, Tank was told to arrange mock-ups and to plan for full production. It had a planned speed of about 1,000 kms/hour at 7,000 metres and it was estimated that 300 aircraft per month would be delivered when production got into its stride, each aircraft being produced in 2,500 man hours. However construction of the first prototype did not commence before the end of the war in Europe. 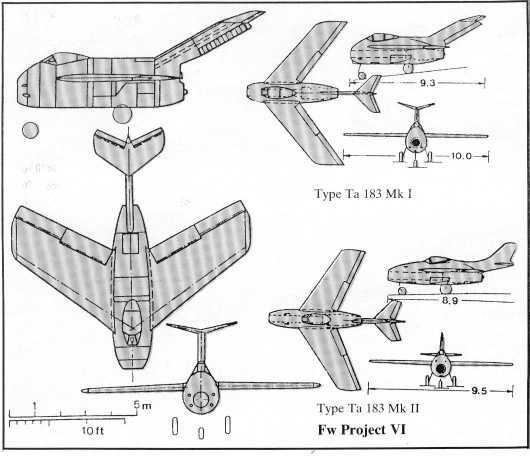 Project VIII (Mid 1944) In spite of the fact that the Ta 183 project was well under way, the emergence of a more powerful Heinkel engine, HeS 021, a propeller turbine, required a test aircraft to be developed. 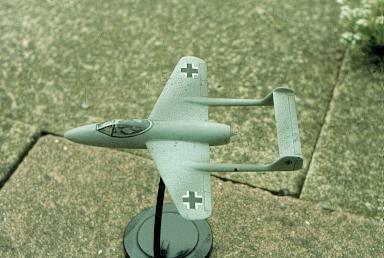 In consequence many parts of the "Flitzer" scheme were utilised to produce an aircraft very similar in shape. The performance was much better, but the non sweepback of the tail surfaces caused estimated problems at high speed and the project was abandoned. Note: The Focke-Wulf Fw 190, designed by Dipl Ing Kurt Tank, had proved so successful that the RLM allowed him to use the first letters of his surname to prefix all subsequent Focke-Wulf designs, these being Ta 152, Ta 153, Ta 154, Ta 183, Ta 283 and Ta 400. Kurt Tank died in the Summer of 1983, in Munich. Comment: British references to the "Huckebein" and Ta 183 projects indicate that the version with the 40° sweep back was the final development. German references do not support this contention and there is no reasonable doubt that the 32° version was the end development. This is supported by the fact that two aircraft of this type were built after the war; one in the Soviet Union and the other by former Focke-Wulf workers in the Argentine. The Soviet version became the MIG15! At the end of the war, like many other German technicians, he continued his professional life in Latin America. The Argentine Government offered him a job at its aerotechnical institute, the Instituto Aerotécnico in Córdoba. He moved there in 1947, with many of his Focke-Wulf co-workers. The Instituto Aerotécnico later became Argentina's military aeroplane factory, the Fábrica Militar de Aviones. There, he designed the IAe Pulqui II based on the Focke-Wulf Ta 183 design that had reached mock-up stage at the end of the war. It was a state-of-the-art design for its day, but the project was axed in 1953 due to Argentina's financial crisis. When President Juan Peron fell from power in 1955 the ex Focke-Wulf team dispersed, many to the United States. Tank instead moved to India. 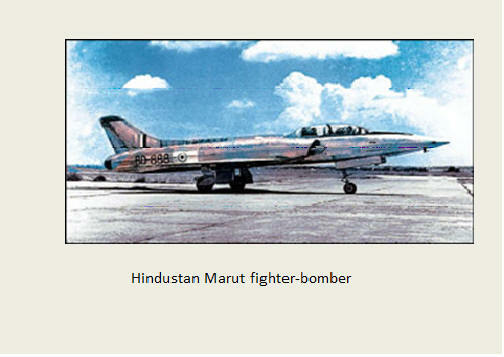 There he designed, for Hindustan Aeronautics, the Hindustan Marut fighter-bomber, the first military aircraft constructed in India. The first prototype flew in 1961; the Marut was retired from active service in 1985. In the 1970s Tank returned to Germany, where he stayed for the rest of his life until his death in Munich in 1983. 1. German Aircraft of the Second World War. J R Smith and A Kay, Putnam, London, 1972. 2. Focke-Wulf: An aircraft album. J Richard Smith, Ian Allan, London, 1973. 3. Lens, K.; H. J. Nowarra (1964). Die Deutschen Flugzeuge. Munich: J F Lehmans Verlag. 4. 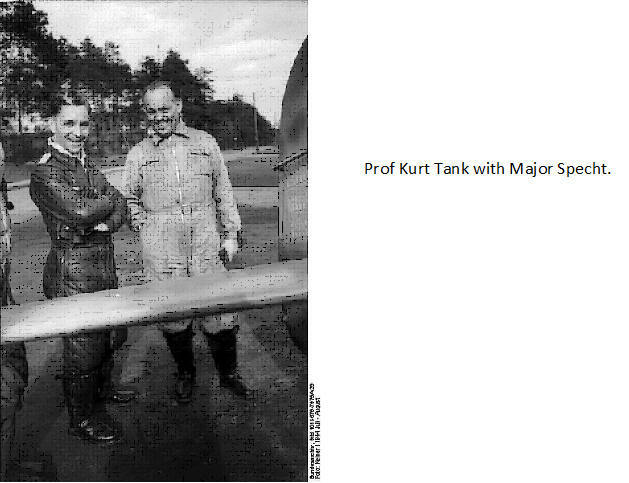 Kurt Tank: Konstruckteur und Test Pilot bei Focke-Wulf. Wolfgang Wagner, Bernhard and Graefe, Munich, 1980. 5. German Jet Genesis. David Masters, Jane's Publishing Co Ltd, London EC1V 2PU, 1982.